Late last week the Texas Department of Information Resources (DIR) released an important whitepaper that reviewed it’s multi-year Pilot Texas Cloud Offering (PTCO). 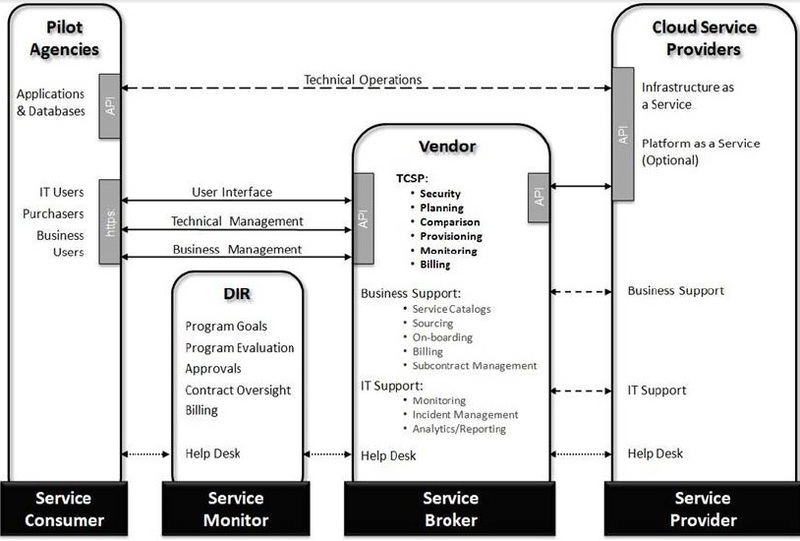 This project was designed to allow a small group of agencies to choose a virtual private cloud-based infrastructure as a service from a marketplace of service providers made available by a cloud broker. For this project, Texas DIR selected Gravitant and it’s cloudMatrix technology. Gravitant’s self-service web portal, Texas Cloud Self-Service Portal (TCSP), allowed participating agencies to manage and support all phases of the engagement from solutioning to provisioning, operations and capacity management, and decommissioning. Gravitant also provided extensive architecture and solution support. 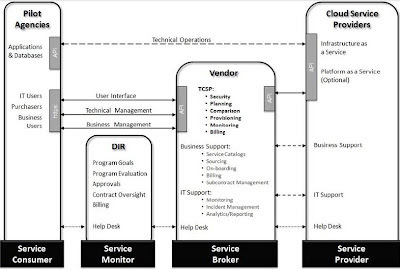 Gravitant, as the cloud broker, established, negotiated, and governed the reseller agreements with the individual cloud service providers. They maintained a catalog of services, line items, and prices associated with each provider, which enabled them to facilitate cloud provisioning across multiple providers—a key feature for government agencies. Provide a means to regulate payment across multiple government entities. If you are interested in learning more about the results of this pilot project, download the complete report at https://www.slideshare.net/kvjacksn/pilot-texas-cloud-offering. NJVC is partnering with Gravitant to bring this advance cloud brokerage technology to the federal marketplace. Very interesting article, thanks for sharing. If anyone is interested in IT infrastructure improvement via cloud-based optimization software, be sure to take a look at AlphaPoint's ITAM solution for IT infrastructure management. Cloud-based software that can take an organization to the next level. Cloud Computing has been growing and creating huge impact on the business growth and specially on IT infrastructure. It is rapidly growing in popularity and general awareness. Cloud computing is very similar to grid computing. Thanks to share this information.You have to know more that iTech is a strategic and successful tool for online businesses and professional service companies.iTech Solution offers Cloud Services.Add versatility to your company with Cloud Hosting, Storage, Servers, Apps and more. Hey! I just saw that your Rss feed of this website is working without any failures, did you somehow complete all the options by yourself or you used the default settings of the widget? Cloud computing is the future and it saves time and money. Cloud computing is rapidly growing in popularity and general awareness, to a point where businesses of all sizes are looking into whether the medium is appropriate for their needs. So, what sort of businesses can cloud hosting effectively and securely handle. Cloud Computing is an application that is currently being adopted by the corporate biggies and small business alike, to reduce the hassles of installing software suites. Services you are offering are pretty good! Pinnacle wetstock monitoring, analysis and loss investigation service is the most effective way to detect and eliminate fuel loss, reduce costs and meet environmental and regulatory compliance.Here you can get top level of service which you want.Pinnacle wetstock monitoring are an independent centralized, scalable and proactive tank leak detection and monitoring service. Cloud Computing Really Works and What are its Benefits for Ordinary Users is really impressive. The benifts of cloud computing are explained in such a easy manner. Ordinary users will surely implement cloud computing with help of this blog. Thanks for sharing such valuable information. Great post! I have been reading blog posts on cloud services all morning because I have heard so much about it lately on TV and online. I'm going to make sure to share this with my coworkers and friends who have also been talking about cloud services. Thank you for sharing this with us Keith!